From 1 January 2018, Tuusula is served by the same bus and train routes as before. 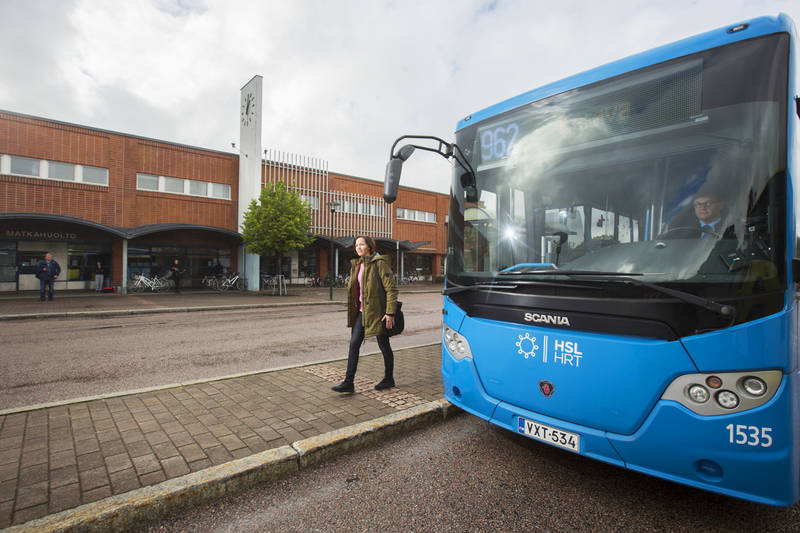 The only changes are that HSL’s tickets are accepted on all public transport services in Tuusula and Tuusula bus routes get route numbers. Timetables remain mostly unchanged. On route 962, early morning, late evening and weekend services are increased. You can travel on the Tuusula bus services listed below with an HSL ticket, provided your journey begins and ends in the HSL area. HSL’s tickets are accepted on these buses also within Järvenpää. Some of the buses continue from Tuusula to Nurmijärvi, Hyvinkää or Mäntsälä. HSL’s tickets are not valid on journeys to these municipalities, you need to buy a separate ticket from the bus operator or Matkahuolto. HSL’s tickets allow you to travel by commuter trains to Jokela station in Tuusula. In addition, HSL’s tickets are accepted at Järvenpää, Ainola, Saunakallio and Haarajoki stations in Järvenpää. Direct bus services continue to run from Helsinki to Hyrylä. From the beginning of 2018, HSL’s tickets are accepted on these buses. At quiet times, you can also travel to Hyrylä by a combination of train and bus via Kerava or Aviapolis. You can change between main line trains and buses going to Hyrylä at Kerava and Järvenpää, Mon-Fri also at Korso. If you are traveling from the south, it is advisable to change from train to bus or vice versa at Korso or Kerava. If you are traveling from Jokela, the best interchange is Järvenpää. Although Järvenpää is not part of the HSL area, you can travel within the town with HSL’s tickets on commuter trains and buses going to Tuusula. Bus 962 runs via Aviapolis station to Hyrylä, from where it continues to Kerava and vice versa. There are buses from Hyrylä to different parts of Tuusula. However, most of the routes mainly serve schoolchildren. There is a direct bus service, 665, from Helsinki bus station in Kamppi to Kellokoski via Hyrylä and Järvenpää. In addition, bus 765 runs once a day in both directions from Helsinki to Kellokoski via Järvenpää. The bus runs along Lahdenväylä. In many cases, the fastest way to travel from Helsinki to Kellokoski is to take an R train to Järvenpää and continue by bus. From the beginning of 2018, also these journeys can be made with one single HSL ticket. There are direct bus services from Kellokoski to Hyrylä via Järvenpää. In addition, bus 65 primarily provides a transport link to schools between northern parts of Tuusula, Kellokoski and Järvepää. You can travel to Jokela by R train and at night time also by T train. Most of the time, R trains run every 30 minutes. From the beginning of 2018, HSL’s tickets are accepted on commuter trains between Helsinki and Jokela. The best option for most journeys is to take a train via Järvenpää or Kerava. Direct bus services run a few times a day between Jokela and Hyrylä as well as between Jokela and Helsinki.